How about a bright summer wedding to lighten those rainy, Monday blues? This urban warehouse soiree brought to us from Elevate Photography, has so many pretty details spread throughout. A gorgeous low-back gown, a calligraphy ceremony backdrop, an open reception space perfect for guests to share dinner family-style, and bright florals are just a few details that stood out from the second we opened the gallery. 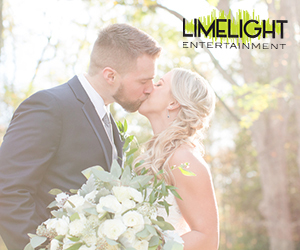 Not to mention, all of Amanda and Aaron’s decisions that brought their wedding to life were intentional, making this wedding truly one to remember. See it all below! From Elevate Photography…To know Aaron and Amanda is to love them. There was not a single conversation with any guest or vendor at the #moochmerger wedding that wouldn’t agree. When I chatted with Amanda’s mom in the bridal suite we both agreed that waking up that morning felt like Christmas – so much excitement and anticipation for this day was finally here and none of us could wait to see it all unfold as perfectly as we knew it would. Everything they put in to this wedding was intentional and full of meaning. Even Amanda’s gown had the “tree of life”; another token that she carried with her to make her father, who recently passed, a part of the day. She wore his ring in her bouquet and took a beautiful moment to light a candle in his honor before the ceremony. He also got to be a part of the festivities, with his candle burning throughout the night. There were so many special moments at this wedding, the photos will hopefully speak for themselves. I will say though, that the relationship that both Amanda and Aaron have with the boys is priceless. They were so proud to be part of the wedding and when they raced down the aisle to hug Amanda before and after the ceremony it was impossible not to recognize that this was not only a coming together of two people in love, but of a new family who really love each other. From their smaller family unit, to their parents, siblings, extended family – friends – there wasn’t a guest who was not deeply loved and valued as part of their family. Amanda is one of those people who calls you “friend” instead of “photographer”, and I will always cherish getting to witness and to be a part of this amazing day. Thank you so much Amanda and Aaron for being who you are! Joni, Christian, and I had the best time at your wedding. So much love.